Circa Survive have announced a fall headlining tour. La Dispute and Queen Of Jeans will serve as support. 11/20 Dallas, TX – Gas Monkey Live! Thrice have announced a headlining North American tour. The band will also be joined by special guests La Dispute and Nothing, Nowhere. Thrice have been working on a new album and have announced their first tour in four years. 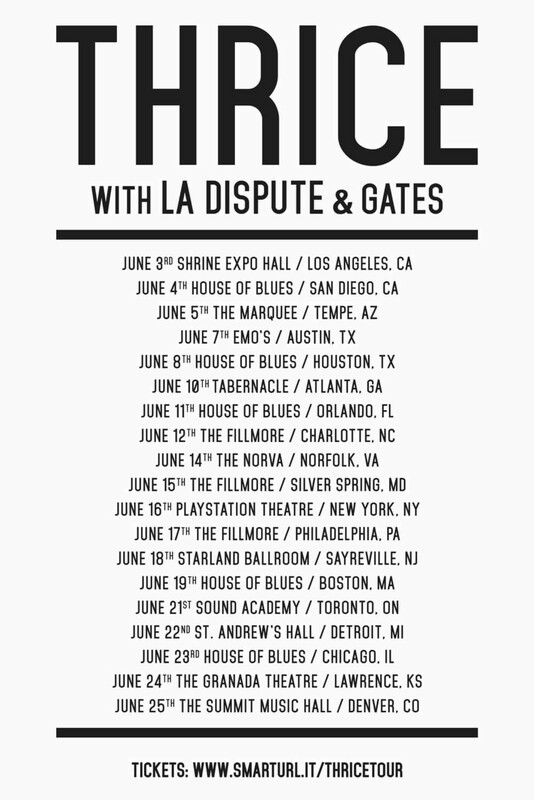 La Dispute, and Gates will serve as support for the trek. The new Nirvana tribute album, Whatever Nevermind: A Tribute To Nirvana’s Nevermind, can now be streamed in its entirety. The compilation was released today (April 18), as part of Record Store Day and it features Torche, Kylesa, Cave In and more covering songs from Nirvana’s Nevermind. A new Nirvana tribute album, titled Whatever Nevermind: A Tribute To Nirvana’s Nevermind, will be released on Record Store Day (April 18). The release will feature Torche, Kylesa, Cave In and more covering songs from Nirvana’s Nevermind. You can hear Circa Survive’s cover of “Drain You” and see the album track listing below. 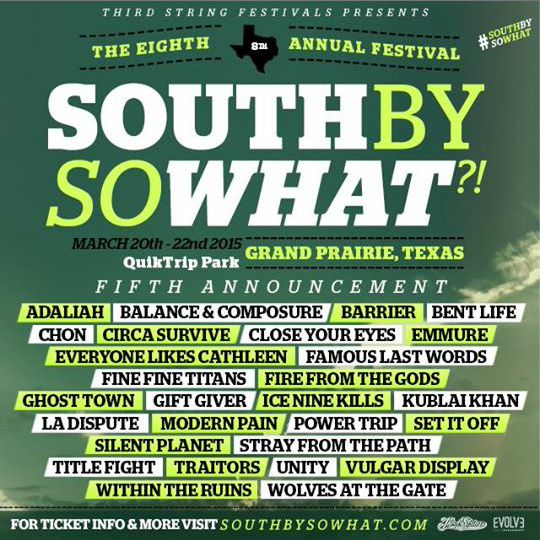 Emmure, Within The Ruins & More Added To South By So What? Adaliah, Balance And Composure, Barrier, Bent Life, CHON, Circa Survive, Close Your Eyes, Emmure, Everyone Likes Cathleen, Famous Last Words, Fine Fine Titans, Fire From The Gods, Ghost Town, Gift Giver, Ice Nine Kills, Kublai Khan, La Dispute, Modern Pain, Power Trip, Set It Off, Silent Planet, Stray From The Path, Title Fight, Tratitors, Unity, Vulgar Display, Within The Ruins, and Wolves At The Gate. Against The Current, As Blood Runs Black, As We Walk, Attila, Carnifex, Courage My Love, Crown The Empire, Death Before Dishonor, Elitist, Every Passing Dream, Hundredth, Knuckle Puck, Like Moths To Flames, My Ticket Home, New Years Day, No Bragging Rights, Norma Jean, Palisades, Polyphia, Rotting Out, Slaves, Suicide Silence, Sworn In, Take It Back!, The Color Morale, The Family Ruin, After The Burial, A Skylit Drive, Beartooth, Betrayal, Born Of Osiris, Boymeetsworld, Chelsea Grin, Front Porch Step, Hawthorne Heights , Memphis May Fire, My Body Sings Electric, Sirens & Sailors, Texas In July, This Legend, Upon A Burning Body, Vanna, Veil Of Maya, and Youth In Revolt. Atreyu, Chiodos, Hatebreed, Motionless in White, Cartel (performing Chroma in its entirety), Capsize, Conquer Divide, Dear You, Driver Friendly, Fallujah, Fear & Wonder, For the Win, For Today, Gideon, Hotel Books, Invent, Animate, I See Stars, Jesse Lawson, Mouth of the South, Oceano, Silent Scream, Superheaven, Last Ten Seconds of Life and This Wild Life, Enter Shikari, He Is Legend, Mayday Parade, Red Jumpsuit Apparatus, The Maine, We Came as Romans, Black Tongue, Boris the Blade, Dayseeker, Ghost Atlas, Lydia, Monuments, Outline in Color, Parables, The Alchemy Index, The Browning, The Ongoing Concept and Yesterday as Today. The festival will take place March 20 – 22, in Grand Prairie, Texas.